The Greater Charlottetown Area Chamber of Commerce will honour Blair Corkum with the 2018 Volunteer Excellence Award at the President’s Excellence Awards on Nov. 14. A CPA with numerous financial planning designations, Corkum specializes in hourly fee-for-service financial planning and financial divorce consulting through Blair Corkum Financial Planning Inc. He grew up in Middle LaHave, N.S. — moving to the Island in 1990 with his wife, Sharlene Clark-Corkum, originally from P.E.I. With an extensive background that also includes accounting, tax and business consulting, Corkum provides vital advice to the people he serves. He lends his expertise and energy to a variety of organizations, including the Chamber. 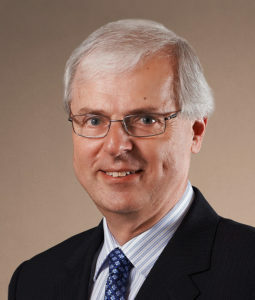 He has twice served on its board of directors (2006-2010 and 2013-2018), including roles as vice-president of finance and member of the executive committee (2014-2018). Known for reasoned consideration of issues, he continues as a valued member of the Chamber’s policy committee. In addition to his Chamber contributions, Corkum has made it a priority to give back to organizations that support education. Since 2006, he has served as treasurer and board member of the Community Legal Information Association of P.E.I. He has also been a national board member (2001-2012) and advisory council member (1991-2001) for the non-profit Canadian Scholarship Trust Foundation, the original founder of education savings plans for children, and given his time to numerous local organizations. On an individual basis, he promotes financial literacy and sound policy by writing financial columns, guest speaking, advising organizations and providing recommendations to government. His work with clients from diverse financial backgrounds helps reinforce his belief in the importance of financial literacy and accessible legal information. In addition, seeing how clients with even modest incomes donate to non-profits further inspires his own sense of service. His community contributions have been previously recognized with an Unsung Hero award from the Rotary Club of Charlottetown Royalty in 2016. The Volunteer Excellence Award, sponsored by Maritime Electric, recognizes someone whose time, commitment and contributions to the Chamber have been outstanding. The Chamber’s executive committee selects the winner from nominees put forward by Chamber members. Each year, the Chamber holds the President’s Excellence Awards to celebrate business excellence in the community. Sponsored by Atlantic Lottery, the awards take place Wednesday, Nov. 14, 6-9:30 p.m. at the Delta Prince Edward. Tickets are available at www.charlottetownchamber.com or by calling (902) 628-2000. Photo: The Greater Charlottetown Area Chamber of Commerce will honour Blair Corkum with the 2018 Volunteer Excellence Award at the President’s Excellence Awards on Nov. 14.